Blissfields Festival is pleased to unveil its headline acts for 2013. Under the banner ‘The Director’s Cut’, the award winning Hampshire festival will be celebrating all things film in its 13th year, from the early talkies to VIP Hollywood parties. 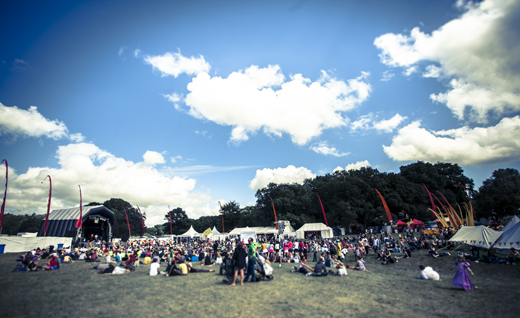 Expect a weekend full of red carpets, interactive games, popcorn-throwing dance-offs, film screenings, the best soundtracks, visual treats, hidden treasures and all the usual fun that Blissfields has become synonymous with… topped by the first announced headline music acts: Mystery Jets & Bastille. Mystery Jets first performed at Blissfields in 2005, the summer before their debut album Making Dens found them acclaimed heroes of indie and leaders of what would become the Thames-beat folk scene that followed. They return to Blissfields after a run of top-40 singles including ‘The Boy Who Ran Away’ and gloriously catchy ‘Two Doors Down’, as esteemed festival headliners, their live set now full of bouncing, rousing and urgent pop songs spanning four albums. It’s with tremendous pleasure that Blissfields can welcome back Mystery Jets who have selected the festival for a unique headline appearance this summer, continuing in the festival's tradition of bringing special performances to a boutique set-up seen previously with Super Furry Animals, Mumford and Sons, Frank Turner and Laura Marling to name a few. They’re joined by Bastille, one of 2013s most exciting breakthrough live acts. Having picked up press and radio support with their single ‘Flaws’ and most recently ‘Pompeii’, with extensive UK touring over the past 20 months, including two sold out nights at Shepherds Bush Empire, they’ve a devoted and fierce fanbase, idolising Dan Smith’s heartbreaking, wild and earnest lyrics. The touching vocals collide into massive pop melodies, making Bastille not just a powerful band for honest song fans, but for any ears of taste the nation over. Their debut album Bad Blood is released this March via Island/Universal and already looks to be one of Britain’s major crossover success stories of the year. Matt Corby, whose Jeff Buckly-inspired soulful folk-rock has caught the inner-ear of the world, attracting over 100,000 Facebook fans and a signing to Atlantic Records, will adorn the main stage, following recent demand that found him selling out four London performances in just one day. Recently featured on BBC Radio 1’s Live Lounge, and receiving huge support from the likes of Nick Grimshaw, Annie Mac and more, Clean Bandit – hailed as a hugely exciting new UK dance group set to follow in the footsteps of Massive Attack and Basement Jaxx, are also confirmed. Fresh from touring the UK’s biggest venues with Mumford & Sons and Everything Everything, Post War Years join the cast of this year’s film-themed event, following the release of their hotly anticipated debut album on Sony/Fiction, while also on the main stage Public Service Broadcasting bring their audio-visuals and historic samples to play homage to “The Director’s Cut” with a performance set to be a unique festival experience. Hampshire born Marika Hackman’s confident and intense style of folk has seen her drawing comparisons to Syd Barrett and Nico, continuing Blissfield’s long standing relationship with supporting the country’s best, brightest folk acts. The Other Tribe have set the free-party scene alight in the South West, looking now to join acts like Crystal Fighters in becoming festival necessities, as Far Too Loud headlines the Hidden Hedge with his frenetic sound that ranked number 1 on the DnB Beatport Chart this January. Blissfields favorite and festival ringleader Beans On Toast will headline the Acoustic Stage, while Subgiant and Subsource, also long-time friends of Blissfields and in-house party bands, make their veteran return to the festival. Zion Train, UK dub / reggae pioneers and acid house fusion wizards will bring their startling music heritage to the Hampshire field for the first time. With Thursday night’s headliner, not to mention most of the festival’s main and second stage acts still to announce, this will surely be another vintage year for Blissfields. Tickets are on sale now via the festival’s website at www.blissfields.co.uk. Tier One tickets are sold out, however Tier Two tickets are now available priced at just £80 for an adult weekend ticket, and £54 for a youth ticket. For the first time Blissfields will also be offering a payment scheme for ticket buying, with the ticket price being split into an initial payment and three further monthly payments, helping our festival family to budget for the weekend over a number of months. Over the past 13 years, Blissfields has grown from a family gathering in the garden of founders’ Paul and Mel Bliss into one of Britain’s most celebrated small festivals, claiming the Best Small Festival 2007 award at the UK Festival Awards. It remains a family-run and totally independent 2,500 capacity festival that takes all of the best bits from the big festivals, and scales it down into an intimate, friendly, beautiful setting, dominated by parkland trees, just outside of Winchester. Previous acts to play at the festival include Mumford & Sons, Laura Marling, Super Furry Animals, Tricky, Ben Howard, Charlotte Church, The Noisettes, Patrick Wolf, Charli XCX, Bastille, Frank Turner, Alex Clare, Jake Bugg (winner of the 2012 Breakthrough Festival Act Award) and many more artists from across the board on genre.